Plastics Technology de México (PTM) is a Mexican company that is specialized in manufacturing and commercializing PVC, corrugated HDPE, and smooth wall HDPE pipes and fitting, from ½” up to 60” in diameter, for the urbanization, industrial, irrigation, plumbing and electric, building, electrical and fire suppression systems. Operations began in 2005 and since then PTM has connected thousands of kilometers of plastic pipe in our country’s infrastructure, the equivalent of going several times around the world. 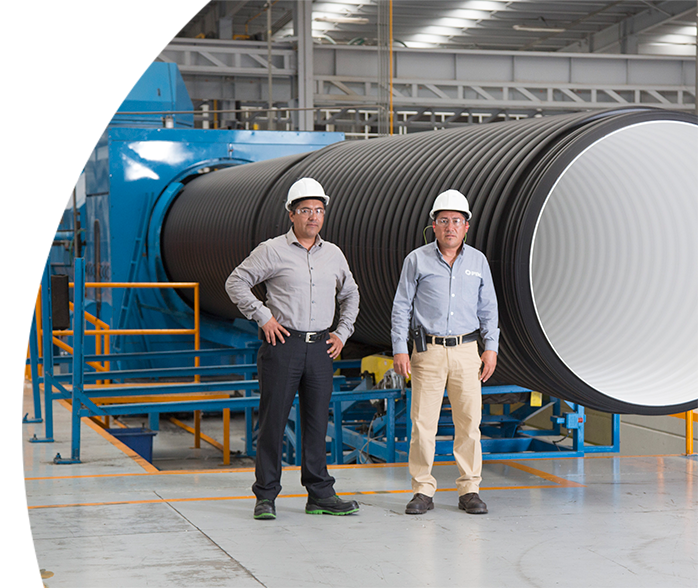 Our growth during this time has currently positioned us as the largest plastic pipe manufacturer in Mexico. We set ourselves apart by working with cutting-edge technology, innovating systems, and operational excellence in order to provide superior service and optimal value for our distributors. Constant improvement and strict standards of quality are a part of our organizational culture, which strengthens us as a competitive and trustworthy manufacturer. PTM pipes connect our clients’ requirements with valuable solutions that inspire long-term partnerships. Our Mission is to efficiently manufacture, sell, and distribute plastic pipes and fittings for our clients, ensuring the best standards of quality, competitive prices, and excellent service. We are always committed to creating a positive impact for our collaborators, clients, partners, communities and environment. Our Vision is to be the best solution for all our clients, for their plastic pipe and fitting needs, which will position us as leaders in the markets and sectors in which we choose to participate.